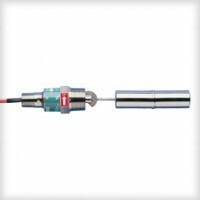 This level switch range solves the problem of point level sensing in tanks with inaccessible tops or bottoms, or at intermediate locations in larger tanks. Operation is positive and dependable. The float pivots with changing liquid level, displacing a shuttle which magnetically actuates a hermetically sealed switch within the unit. Installation is through the tank side at the detection point. Rugged, all-stainless steel unit offers broad chemical compatibility at temperatures to 300°F (149°C). Explosion-proof (CSA/FM approvals only) and intrinsically safe models available (LS-52100(E)) (see ATEX section).